City and county employees are starting to climb out of the deep hole into which the Great Recession plunged them. Wages are increasing, layoffs have decreased significantly, and some jurisdictions are even hiring new workers. Medical insurance payments have been stable on average, but the settlements have been “all over the map,” Keenan adds. “Employers seem to be continuing their quest to pass on cost increases by boosting the portion of the premiums that are paid by employees. Where there are premium increases, they tend to chew up some of the wage increases, Keenan says. The public sector recovery tends to lag behind the general economy, he adds. Just as it took a while before the full force of the recession hit the public sector, so the public sector is now following the uptick in the general economy that began a couple of years ago. 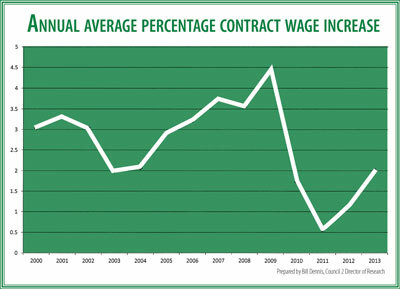 As the pickup continues, public sector employees can expect the upward trend to continue, Keenan says. But, he adds, many of the smaller cities and counties that do not have the financial resources are still having a real struggle to balance their budgets.